I made meatballs for the Italian Wedding Soup (see post below.) My man and I kept talking about the meatballs. They were so good and we wanted more!!! So tonight I made the same meatballs (actually they are turkey/chicken-and-pork-balls), and served them with spaghetti and marinara. 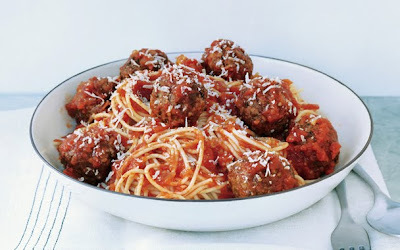 I used a store-bought marinara, but I think these 'meatball's' would be fantastic with a puttanesca. While meatballs are cooking, boil water and cook pasta until tender. Heat sauce through, and add meatballs when they are finished.